When you still have devices in your environment which are only supporting legacy PXE boots and you also want to support UEFI PXE boots with the same task sequence this blog-post is meant for you. 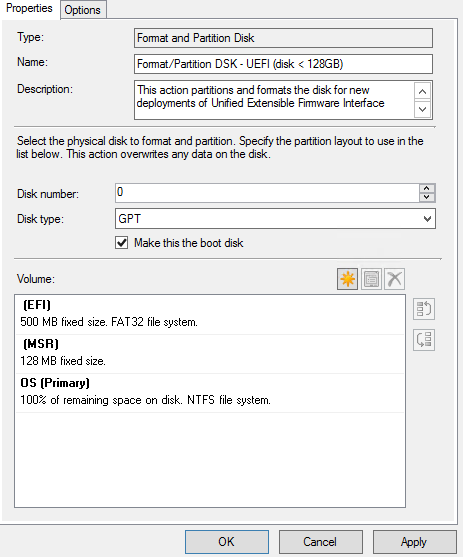 I will also give you some additional options you can add to your partitioning step in the Task Sequence (TS) which could come in handy. Although I recommend using IP helpers above using DHCP, because IP Helpers are much more reliable, underneath a step-by-step guide to configure DHCP for PXE booting legacy and UEFI in your network. Create custom Vendor Classes as described in the following steps, these will help to determine how the devices are requesting the boot image from the DHCP server. 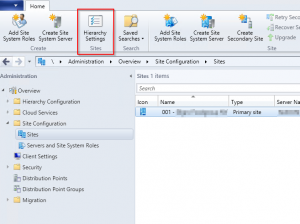 Be sure that on the Configure settings for the policy page that ‘DHCP Standard Options’ is selected. 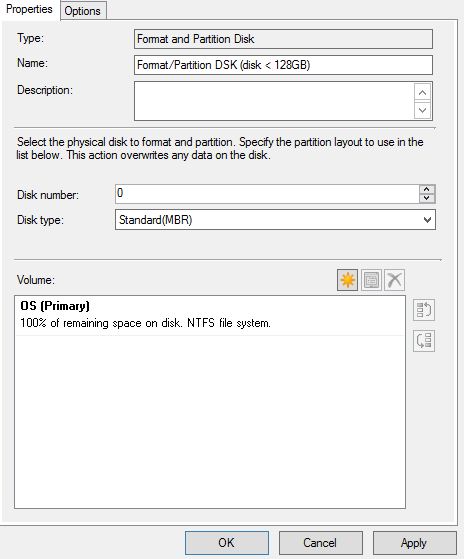 And change ‘>’ to ‘<‘ to detect if the disk is smaller and you only want one partition. If you have any comments or questions about this blog post please post them below in the comment section and I will try to answer them as soon as possible. A new month, a new technical preview and new thoughts! Technical preview 1702 introduces a new option in SCCM to send feedback or do feature requests. The home ribbon will have a feedback option but you can also klick on any object in the console. When clicking on feedback, a browser will open a link to the System Center Configration Manager Feedback site. 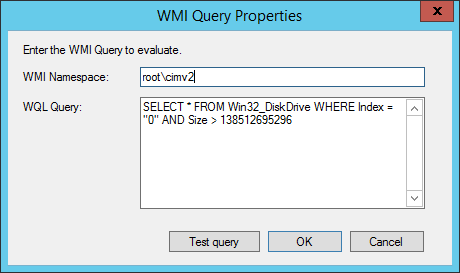 Does this add any value to SCCM? No I do not think so! although it will be a lot easier to send feedback to Microsoft. I just hope it will not be used as a place for bashing whenever things go wrong. With 1702 they have simplified the updates and servicing view. When SCCM is more than two (or more updates) behind ‘Updates and Servicing’ will only show the most recent version available. Every new update contains all previous updates so in my opinion this is a great feature. Off course you will still be able to download more previous versions but you will get a warning that it is super-seeded by a newer version. The most recent update will be downloaded automatically when available while older updates, also when not used, will be automatically deleted from the ‘EasySetupPayload’ folder. I really like these new settings! They will give us more control over when devices are available for peer caching. You simply don’t want to encumber systems which are low on resources. This way your are more likely to use peer caching. With this technical preview version you can manage devices that are joined to an Azure Active Directory (AD) Domain Services managed domain. You can also discover devices, users and groups in that domain with various Configuration Manager Discovery methods. At the moment I am not using Azure AD in combination with SCCM but this is great feature for people who are working with Azure AD. This feature only applies to iOS and Android devices. This will help organizations to mitigate data leakage through unsecured iOS or Android apps. You have to configure the apps in a non-compliant list yourself. It will block access to corporate resources that support conditional access until the user has removed the app. Downside is that you will need to determine and configure the apps by yourself. If you are not aware of the app that could be leaking data, this feature won’t help you much. But it will certainly help blocking certain apps which you don’t want to be installed on your corporate iOS or Android devices. For example when a app uses excessive data consumption. When 20% (default) or more of your managed clients is using an outdated version of anti-malware (Windows Defender or Endpoint Protection client) Configuration Manager Endpoint Protection will generate an alert. Great feature when u are using SCEP or Windows Defender in your environment. I wonder how this is measured and in which time frame will a client be marked as outdated? I am not going to explain what ‘Windows Update for Business Updates’ is. Therefor I would like to point you to the following technet article. From this technical preview on you can now configure a compliance policy update rule to include a Windows Update for Business assessment result as part of the conditional access evaluation. Important: You must have Windows 10 Insider Preview Build 15019 or later to use compliance assessment for Windows Update for Business updates. In the properties for the task sequence, you can now configure any task sequence, including non-operating system task sequences, as a high-risk deployment. Any task sequence that meets certain conditions is automatically defined as high-impact. 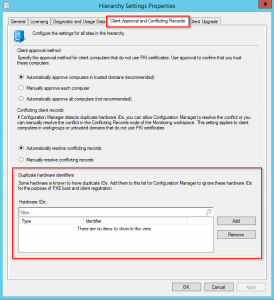 For details, see Manage high-risk deployments. 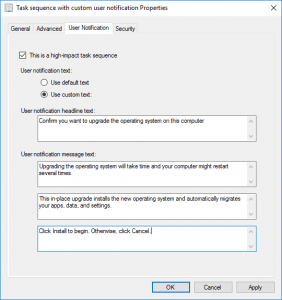 In the properties for the task sequence, you can choose to use the default notification message or create your own custom notification message for high-impact deployments. In the properties for the task sequence, you can configure Software Center properties, which include make a restart required, the download size of the task sequence, and the estimated run time. The default high-impact deployment message for in-place upgrades now states that your apps, data, and settings are automatically migrated. Previously, the default message for any operating system installation indicated that all apps, data, and settings would be lost, which was not true for an in-place upgrade. This is simply awesome! I believe that user communication is a key feature for a successful deployment of software, applications and releases. For complex updates I always use the Powershell App Deployment Toolkit and all of its nice features. But for more straight forward and simple deployments, which will need less communication, I can use this new feature. Hopefully they will expand it with more possibilities in the near future. Again this is a great new feature which they added, too bad its only for applications in some scenarios I still use packages. But nevertheless this is a great feature which I will be going to use on a frequent base! I always had to use scripts or the Powershell App Deployment Toolkit to achieve this, this will save me a lot of work in the future! Hopefully they will expand this feature in the future for packages and task sequences and maybe add a message. A nice addition to this will be to let the users decide themselves if they want to close the process/executable before continuing or if they want to delay the installation until a pre-defined deadline. Well these were my first thought on SCCM CB technical preview 1702 this month and I will be continuing my ‘first thoughts’ on all upcoming technical previews. If you have any thoughts yourself or any questions please post them below in the comment area. A few days ago Microsoft made technical preview 1701 for SCCM available for download. Here are my first thoughts on this technical preview (TP). 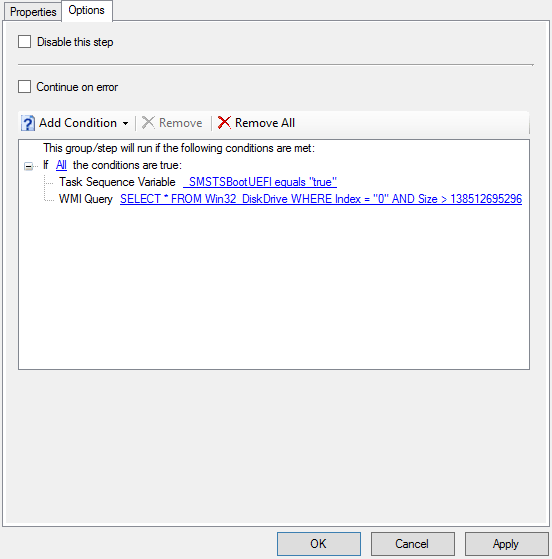 In CB 1610 Microsoft introduced important changes to boundary groups and how they worked with Distribution Points. With TP 1701 they are taking it a step further by adding the Software Update Points role. 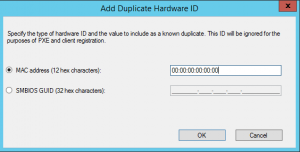 With TP 1701 you will be able to manage which SUP a client can use and which SUP’s it can use as fallback depending on which DP it’s connected to. Please take note that the fallback time is not yet fully supported therefor it can take upon 2 hours before a client will use it’s fallback SUP. This feature will be more than welcome for a client I am working with at the moment. They’ve got multiple DP’s across the country with slow WAN’s The possibility to decide which boundary group is using which SUP and fallback SUP will be a great addition. This new feature is enabled by default when TP 1701 is installed. A new inventory class (SMS_Firmware) and property (UEFI) will be filled. The UEFI property will be set to TRUE when a computer is started in UEFI mode. This will probably be useful in some circumstances when u want to know if a device or more devices use UEFI or Legacy BIOS to boot up. Microsoft listened to the community for most of these improvements. Lets see what they are and what they can do for us. The number of applications you can add to this step have been increased to 99 applications. Previous count was 9 applications. I still prefer using packages for my task sequences so as long as we can still use packages I probably won’t be using applications within my OSD task sequence. And I’ve never been in the situation that I needed to use them in my task sequence. That said I believe for those who do and maybe for future use it’s a good improvement. It will be possible to optionally set start and expiration dates when you create standalone media. This will be needed when you want to expire certain deployments through standalone media when you don’t want the media to be used after and before a certain date. I don’t use standalone media that much but I can imagine it ill be useful when for example deploying certain software or operating systems for a specific time frame and you don’t want it to be used in a later stadium or before a specific date. It used to be only possible to add content which was referenced to the task sequence while creating standalone media. With TP 1701 it will be possible to add additional packages, driver packages and applications on the media. This could come in handy when u want to launch additional software and/or scripts after the task sequence is ended. I can imagine combining this with a script launched by the “SMSpostAction” feature which was added in SCCM 2012 R2 a while ago. I wrote a blogpost (link) about this variable which you can set during your task sequence. I almost never use the step “Auto Apply Drivers” within a task sequence. I prefer using a tool from the hardware supplier for installing drivers. This way the drivers are installed the way it’s meant to be installed by the supplier. Most big hardware suppliers like DELL, HP and Fujitsu have their own SCCM or command line tooling for installing their drivers. But if you don’t have a choice and/or you prefer to use this step Microsoft added a foursome variables to timeout this step, values are in seconds. Any task sequence step that references a package, driver package, operating system image, boot image, or operating system upgrade package will now display the package ID of the referenced object. When a task sequence step references an application it will display the object ID. This is a great feature, I really love this. 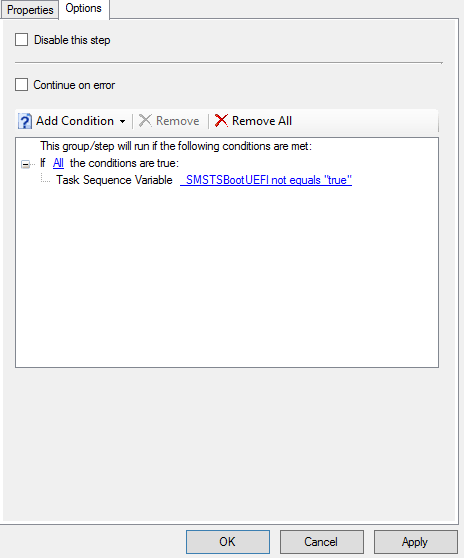 This will make troubleshooting the task sequence easier and its just a small change. You don’t have to search for the specific ID first before you go search in your logs. I see myself combining this with the variable “SMSTSErrorDialogTimeout” set to 0 (forever) so I can quickly see which package/object ID is involved when my task sequence is failing. For example if the site has Windows ADK for Windows 10, version 1607 installed, you won’t be able to edit boot images other than 10.0.014393 in the SCCM console. I can imagine that this will become less practicable when you want to troubleshoot with different versions of boot image versions. I always use custom boot images and it will still be possible to adjust the source path for custom boot images. I see no problems with this adjustment and I think it will be a nice addition that you can always find your default boot images on a fixed location. Since you can download software updates directly from Microsoft Update this new feature isn’t that appealing. But I believe the feature set for cloud-based distribution points will grow in the near future and it will become more practicable to use cloud-based distribution points in the future. I haven’t used DHA before and it was first introduced in Windows 10 version 1507. For more information about DHA I suggest to read the following Microsoft Article (link). 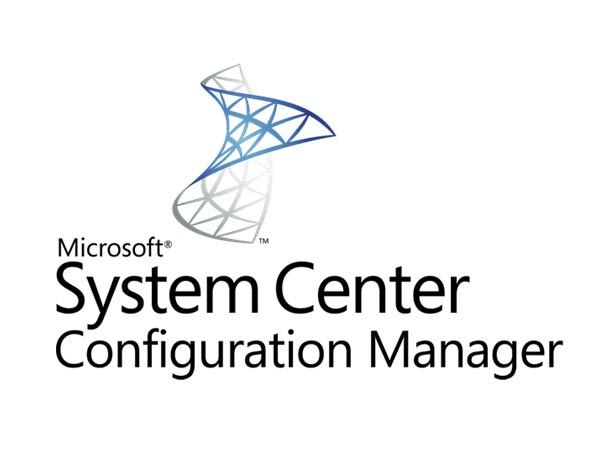 With this technical preview, you can now use the Microsoft Operations Management Suite (OMS) connector to connect to an OMS workspace that is on Microsoft Azure Government cloud. I love OMS, nothing more to add. It’s always nice to see things get more simplified and this is one of them! Madrid – Amsterdam, June 25, 2013 – Today, at TechEd Europe 2013 in Madrid Spain, Project Virtual Reality Check (Project VRC) announced the release of a new white paper about the relative impact of Microsoft Office on the performance of VDI based user environments. Microsoft Office is the most used application suite in the corporate environment. The goal of this new white paper was to investigate and document the VDI performance impact of Microsoft Office 2013 in comparison to the previous two versions of Microsoft Office, 2007 and 2010. The comparison of Office 2007 with Office 2010, showed only a 1% performance difference in favour of Office 2007. The comparison of Office 2007 and Office 2013 showed a significant performance decrease of over 20%. This leads to the conclusion that to maintain the same performance levels with the newest version of Microsoft Office, about 20% more infrastructure capacity may be needed. Office 2013 also consistently uses more CPU and over 272% more memory than Office 2007. In comparison, Office 2010 only uses 26% more memory. Optimizations such as turning animations and hardware graphics acceleration off did not influence the performance in any way. Another key finding published in the white paper is that running x64 versions of Windows and Office will have substantial impact on Storage IOPS and memory footprint in comparison to x86 versions. Project ‘Virtual Reality Check’ (Project VRC) was started in 2009 by SBC and VDI specialists PQR (www.pqr.com) and Login Consultants (www.loginconsultants.com) and focuses on independent research in the desktop virtualization market. Several white papers were published about the performance of different hypervisors, application virtualization solutions, Windows Operating Systems and antivirus solutions. All Project VRC tests are performed with Login VSI (www.loginvsi.com). This vendor independent tool simulates realistic user workloads to objectively test the performance and scalability of VDI and Server Based Computing environments. The full test methodology used is described in the white paper. This and all other Project VRC white papers can be downloaded for free at www.projectvrc.com. To keep up-to-date with the latest developments you can follow Project VRC on Twitter @ProjectVRC. PQR is the specialist for professional IT infrastructures with focus on safe and manageable availability of data, applications and workstations with optimal user experience. PQR provides its customers with innovative IT solutions that ensure optimal application availability and manageability, without complex processes. Simplicity in IT, that’s what PQR stands for. PQR was founded in 1990, is located in De Meern, The Netherlands, and has over 100 employees. In the fiscal year 2011/2012, PQR achieved a turnover of € 94.9 million and a net profit after tax of € 4.6 million. Login Consultants has an experienced team with over 150 specialists in The Netherlands, Belgium and Germany. Our consultants have accreditations from Microsoft, Citrix and VMware, and are regularly invited to speak at national and international events. They are involved as experts in online and printed IT publications and actively participate in relevant technical blogs.